The streets of Belfast were nearly empty, just a handful of buses and the odd car easing through the city. It was the summer of 1994 when the Tour De France had not yet been tarnished by widespread drugs scandals and my mate Alan Ritchie and I were inspired by the performances of sprint specialists, time trialists and Tour winners. Each night that summer we pulled on our pro-cycling replica jerseys and jumped on our bikes. I wore an ONCE jersey and rode an old 1980s steel framed Peugeot that my Dad owned before me. Alan rode a Raleigh Team Banana and wore a Carrera Jeans jersey. We powered through the city streets in our own imaginary time trials. We raced the buses and each other, sprinted through traffic lights about to turn red and broke free from fictional pelotons, crossing imaginary finish lines with arms held high to celebrate multiple fantasy stage wins. But losing my sight in 1998 meant the days of surprising the opposition by making a break from behind the bus as it pulled off were gone. So too was my ability to look over my shoulder to see if I had broken away from the one-man peloton. Like so many things, the independence that the bike gave me disappeared along with my sight. But it soon became clear, I just needed a work-around and that came through my Trek tandem road bike and my mates to pilot me. They were great years and for that reason, despite breaking my back in 2010, I haven’t been able to sell my tandem; I’m much too attached to it. Nick Wolfe, James O’Callaghan, Brendan Smyth all piloted that bike and led me through Ireland’s Wicklow 200, New Zealand’s Coast to Coast and Zurich’s Ironman. Now, 22 years after those summer time trials with Alan in Belfast, and 6 years after breaking my back and losing my ability to ride my tandem I am back in the saddle. And for the first time in 6 years, I am competing in sport. It seemed it could never happen – the blindness took me out of the sports that paralysed people competed in and the paralysis took me out of the blind-friendly sports I’d built my adventure athlete career on. 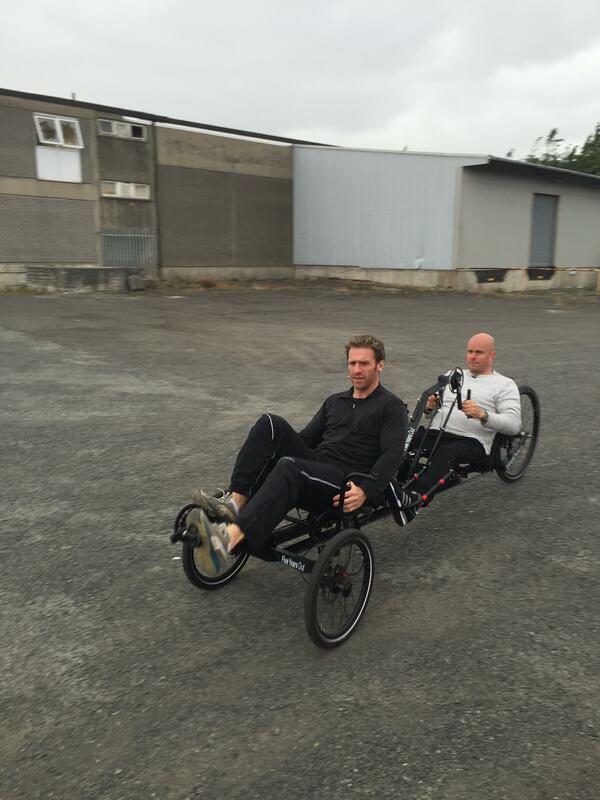 But a new bike – a glorious custom built tandem from Utah Trikes is the bike and pilot, Simon O’Donnell, my teammate from the South Pole Race, are both changing all that. I can’t quite believe it yet, but I will be back cycling in Northern Ireland on the 10th September. We will be taking part in the cycling event – the Giant’s Causeway Coast Sportive. 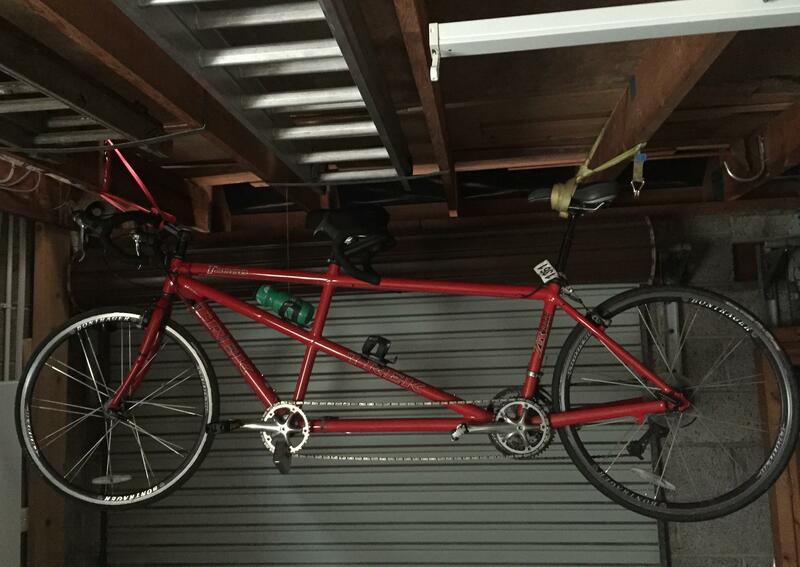 The Peugeot is long gone and the Trek tandem is in dusty retirement hanging from the joists in my Dad’s garage. And the freedom they represent to me is being unlocked by my Utah Trikes tandem. I will get to feel the buzz of competition, the pain of the effort and the shared purpose of the hundreds of competitors as we snake along Northern Ireland’s spectacular Causeway Coast. And, like those early days in Belfast, Alan will again be cycling alongside me. He will be on his Boardman road bike, (a substantial upgrade from his Raleigh Team Banana). We won’t be wearing replica pro-team jerseys, rather, along with a massive group of riders, we will be wearing #TeamUnbreakable jerseys with Mark Pollock Trust and Arrow Electronics’ logos on them. We’d love you to join us on #TeamUnbreakable. Go to www.markpollocktrust.org/teamunbreakable and sign up for £85/€100 and choose to ride 57km, 126km or 182km routes. • Be part of our crusade to find and connect people to fast track a cure for paralysis. • Get a copy of the award-winning documentary ‘Unbreakable – The Mark Pollock Story’.